Hamas backs Abbas’ plan to end ‘Israeli occupation'. Submitted by Dette_McLoughli... on Sun, 31/08/2014 - 15:40. Hamas and the Palestinian President Mahmoud Abbas have reportedly agreed on a three-stage plan that would create an independent Palestinian state, first of all calling on the US to come up with defined borders that Israel would agree with. According to the Saudi daily Asharq Al-Awsat the agreement was reached between Abbas and Hamas leader Khaled Meshaal in Doha. According to the initiative, the US serving as a mediator in negotiations will be given a four month deadline to reach an agreement with Israel and demarcate the map. “If the two parties agree, immediate negotiations, governed by a deadline, will begin. During the talks Israel will be asked to provide a map of its borders,” a Palestinian source told the Saudi daily. Such a proposal however is most likely to fail, as history shows, Israel is reluctant to negotiate with Hamas, an organization which at its core does not recognize Israel’s right to exist as a nation. Therefore, if the US or Israel object to such proposal, the next phase of the plan would be to seek international recognition via the Arab League in the UN Security Council, in order to “request the evacuation of Israel from Palestinian territory within a specific and defined period of time,” the official said on condition of anonymity. This option is also highly likely to fail as Washington, the key ally of Israel, might use its veto power in the Council to block a Palestinian recognition bid. President Mahmoud Abbas may use the global stage of the General Assembly to publicly demand end to Israeli occupation, New York Times reports, citing Palestinian ambassador to the UN , Riyad H. Mansour. So, the final option in the three-stage plan is to further expand Palestinian state recognition by applying for membership of international organizations – including the International Criminal Court. This way, Palestinians hope they can eventually request an investigation into alleged Israeli war crimes in Gaza. 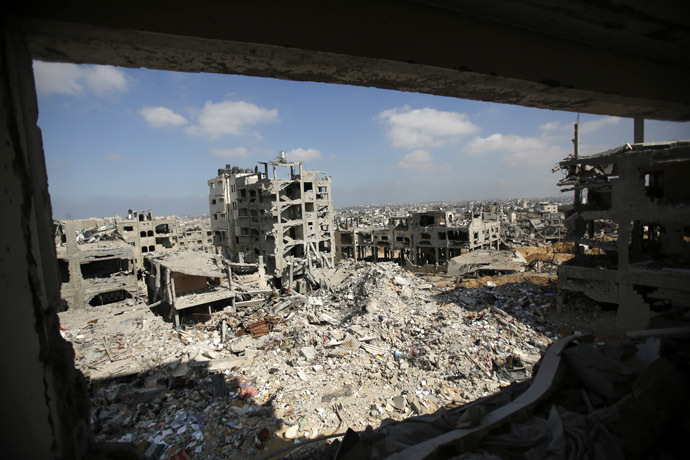 The three-phase plan follows seven weeks of Israeli air strikes and Hamas rocket attacks that has left more than 2,100 Palestinians dead, mostly civilians. IDF casualties stand at 65. Negotiations to find a long lasting peace after the August 26 ceasefire will resume next week to finalize issues such prisoner release and lifting the blockade, a Palestinian official said. In 2012, the UN General Assembly upgraded Palestine from an “observer entity” to a “non-member observer state.” A successful application for membership in the UN would require approval from the UN Security Council and a two-thirds majority in the UN General Assembly.